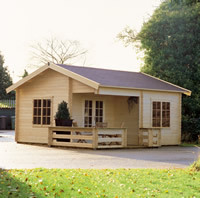 At Finlog Homes we supply Lugarde Log cabins. 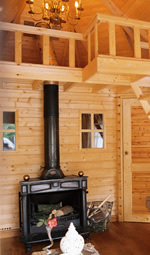 fits in with your home and environment. You can, together with us, set out your requirements on paper together with a sketch, whereupon we can look at the options for your design and draw up a non-binding offer. 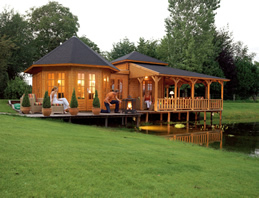 Once you are happy with the design, a more detailed drawing will be made at a cost of €100; this amount will be refunded as soon as the log cabin or summerhouse has been delivered. All models are delivered, as standard, inclusive of glass, pressure impregnated foundation beams, chrome metalwork (if you want brass metalwork, please specify this on your order, no extra charge). A wooden floor is optional. The standard colour of the shingles is green; if you want a different colour, please mention this on your order. The roofs are delivered in loose parts: rafters, roof sections and shingles. 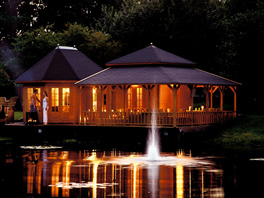 All log cabins are delivered exclusive of set-up. The single doors are always left-hand ones; iif you want your door to open differently, please indicate this on your order (no extra charge). For double doors, the right door is the wicket door. All models in 44 mm are also available in 68 mm.